My shortcut spin on this Italian pasta classic will have you digging into a steaming plateful in 10 minutes. And my outre entree will never be taught in culinary colleges -- you can only learn it in The 99 Cent Chef's kitchen of hard knocks! What does one do with the rest of that package of Bacon Bits you sprinkled over your Cobb salad? You can add the salad topping to this 99 cent creative take on Spaghetti alla Carbonara. Watch my new cooking video for the simple step-by-step directions. It doesn't come cheaper than this; and my new pièce de résistance is outrageous enough to fit into my blog of recipes perfectly! Typical Carbonara main ingredients are: eggs, pasta, black pepper, grated parmesan cheese and Italian bacon (pancetta or guanciale); kind of like an Italian-style breakfast entree with spaghetti. I normally use a couple slices of browned and crumbled bacon because it's convenient, and bacon fat enriches any pasta dish. However, those are a lot of calories, and real Bacon Bits are already cooked, so most of the fat is rendered out, thus making my Carbonara lighter. I've been buying my Bacon Bits, pasta and eggs at my local 99c Only Stores lately. These budget items come cheaply at most any regular market. I can get 2 servings out of one 2.8 ounce package of Bacon Bits. 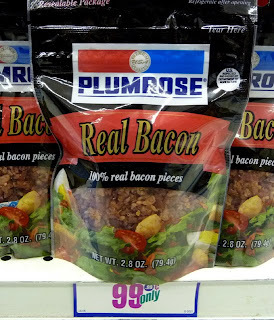 I've been eying Imitation Bacon Bits but have not had the guts to use them yet - The 99 Cent Chef has standards, too! This is a rich tasting dish when you add a raw egg to hot pasta. The trick is to assemble it all in one pan and bring it right to the table before the egg scrambles. You pour a couple of tablespoons of hot pasta water into the spaghetti with Bacon Bits, and finish it all off, add a beaten raw egg, black pepper and parmesan blend. 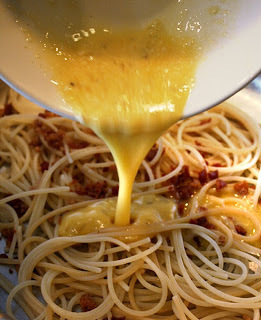 The egg mixture thickens into a decadent sauce, coating the spaghetti, studded with crunchy bacon pieces. *If you are worried about using raw egg, I have an alternative method at the end of this post. This is a versatile dish with many variations. I have added sauteed garlic, red or yellow bell pepper, and onion. Frozen green peas add color and extra flavor -- they thaw out when you add the hot pasta water. If you have an Italian deli nearby, or a well-stocked meat market, you should try Italian pancetta at least once; you only need a couple of slices for this dish. It cooks like bacon, but it's dryer, leaner, with flavorful curing spices. So, check out my latest recipe video and get cooking! It is a simple and delicious dish. Play it here. The video runs 4 minutes 31 seconds. 1/3 package of spaghetti - cook per package directions. I usually shave off a couple of minutes cooking time for pasta al dente. 1/2 package of Bacon Bits - real bacon, not imitation. Okay to use a couple slices of cooked bacon. 1/2 tsp. of black pepper - fresh ground if you have it. 1 egg per serving - for a richer sauce use 2 egg yokes. 4 tablespoons of grated parmesan - I used real parmesan from the jar, but if you have a block of parmesan to shave, all the better. Water for boiling pasta - reserve 1/4 cup of hot pasta water for sauce. Bring one pot of water to boil for pasta. In a small bowl, mix one raw egg with 2 tablespoons of grated parmesan, and about one teaspoon of black pepper. Whisk together until well blended. Set aside until final assembly. Add pasta to boiling and salted water. Cook pasta while preparing the rest of the carbonara -- I usually shave off a couple of minutes of package directions boiling time for pasta al dente. 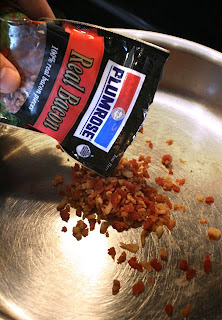 In a large pan over low/medium heat add bacon bits to heat through. When spaghetti is done drain (reserving some of the pasta water) and add to bacon bits. 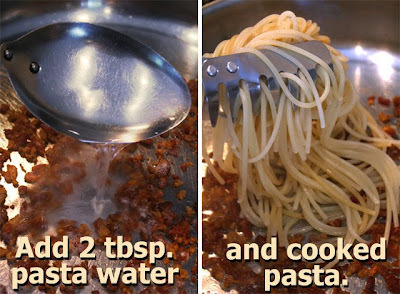 Add 2 tablespoons of hot pasta water to spaghetti and bacon bits. Finally, pour in egg and parmesan mixture. Mix well and allow to heat through for about 30 seconds - careful not to make scrambled eggs. The egg mixture will thicken with the addition of hot pasta water. For 2 servings, just double everything - maybe go with a whole package of spaghetti and one whole egg and two egg yokes, for a richer sauce? * If you are wary of raw egg, it's okay to drop a separated whole egg yoke into boiling water for 30 seconds (or longer.) When pasta is done and parmesan is added, finish dish by adding one, or two, poached egg yokes on top. 99 Thanks to my friend Pete for the camerawork. Be sure to check out his outrageous videos by clicking here; and his funny sports blog is just a click away, here. Great. 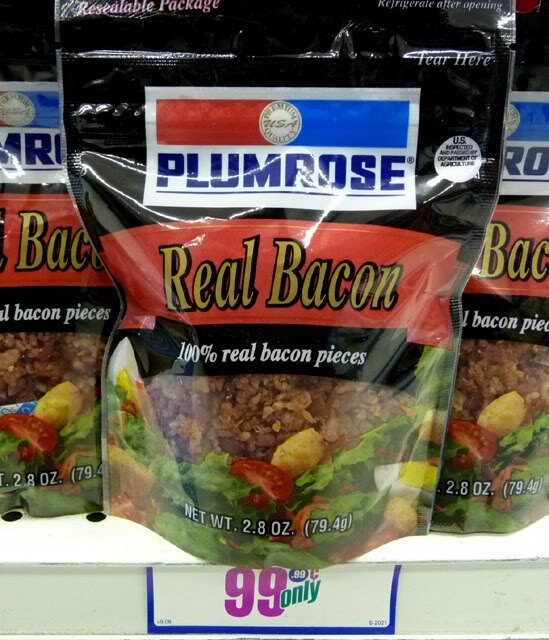 Now I know what to do with the half package of bacon bits I always end up with. Have one in my fridge right now, but it may be too old to use. And wow--cage free eggs for 99 cents a dozen..can't beat that. Hope I find all those good deals when I'm in TX this summer and hit the 99 cent stores there. I have been a 99 cent shopper/cook for the 20 years I've lived in LA. I sing 99 praises to everyone who sits still long enough. No no no. Pre-grated Parm in a can?! Can't pull that trigger. Not for 99 cents. Not for nothing. My cheapie recipes are adaptable - adding fresh shaved parmesan? Hey no problem, I've saved you enough to splurge!! You are a GENIUS, chef! It's like bringing Rome to my kitchen for only 99cents! Would you suggest tempering the egg prior to adding it to the pasta and bacon mixture? I am a novice cook and would hate to ruin the dish at the last step. thank you! I found your blog before I new about the 99cent only store and was lucky enough to have one open up a couple blocks from my house a few months later! love your ideas! Made this tonight and my family loved it! I will make this again. hi Wasted Youth, I encourage tweaking any recipe; I never make them the same way twice. Try an egg yoke only (and less water) it will be creamier. And if you are worried about salmonella try a pasteurized egg substitute! If the pasta is hot enough it should be as safe as eating a breakfast of eggs sunny side up. hi Regina, I'm glad you & family liked it. hi Ruth, wow what a twist on my 99c recipe. Another variation for those with raw egg phobias -- just poach your egg yoke and add it to top of plate of spaghetti. I love your cooking videos! I just discovered your blog today, and am having fun checking out your posts. Thank you! Thanks again for an easy and frugal recipe, chef! I added some leftover steamed broccoli, and it worked very well. I have made this a couple of times when I have been just slammed for time and busy with kids. My 6 year old, who abhors any kind of tomato sauce, really liked this recipe. I used egg substitute, since it is pasteurized, and it came out just as good as versions I have had in restaurants. If I had known how easily and cheaply this could be made, I would have been making it for myself (and the family) years ago. Thanks again chef! For folks worried about using raw eggs in their Carbonara, I used Aldi's Fit and Active brand Egg substitute. It is already pasteurized, so I felt very comfortable serving it to my family. I could taste no discernible flavor difference between the batch I made with real eggs, and the batch I made with egg substitute. Another great recipe, chef! Oh, and Ruth, I wrote your recipe down too, and will be trying it in the near future. It sounds delicious! Those are the prettiest noodles that I ever did see! Carbonara is my favorite, and I ADORE how quick and easy this is!